By its very nature, the business of security is closely connected to risk: if you’re considering a burglar alarm, a fire alarm or CCTV you are generally doing it because you perceive there’s some kind of danger. That said, is it really ethical to trade on people’s fears in order to achieve sales? We don’t think so. We like to reinforce the positive benefits you get from one of our security systems. However we do hear of some security firms who prefer to sell by making customers afraid of what might happen if they don’t buy. For example – our approach: an intruder alarm gives you peace of mind that your home has extra protection and an early alert to danger even when you’re asleep. Others’ approach: if you don’t have an intruder alarm somebody could gain access to your home while you’re asleep and you wouldn’t even know. The first approach helps you feel safe and reassured. The second creates fear and paranoia. 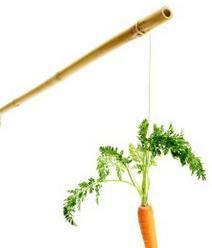 Classic carrot and stick. Presenting a ‘worst case scenario’ probably achieves the desired response – nobody wants to feel like they’re exposing their family/home/business to danger – in fact it may even allow less-than-scrupulous sales people to sell a system that is over and above the customer’s actual need, but we’d rather not get business that way. We think that our customers understand the risks and what they want is reassurance that the solutions we give them offer appropriate protection, protection that is tailored to risk based on their circumstances. Not over sold, not influenced by emotive spiel. If you prefer to be bashed with a stick and feel the fear that’s fine – your needs will be well met by the companies out there that will relate their best horror stories – we just think a bit of positive reinforcement is a more responsible way to trade. If you agree why not get in touch.